Alice knows her journey through Wonderland has truly become “curiouser and curiouser” when she encounters the grinning Cheshire Cat. In between appearing and disappearing bit by bit, this striped, smiling pussycat is always happy to give Alice advice, even if it makes very little sense. This hand-inked, hand-painted, limited-edition cel portrays scene 18 from Sequence 7.5 of Alice in Wonderland (1951). In order to present a full-figure image of the now-you-see-him-now-you-don’t Cat, different elements from two different scenes were combined to create this classic pose. Walt Disney called Wonderland “a wonderful world of colorful characters,” and one of the most famous Wonderland citizens is the Cheshire Cat. 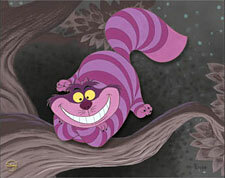 Lewis Carroll, author of the original book, was inspired to create this slyly smirking character by the phrase “grins like a Cheshire cat,” a popular saying of the day. In the hands of animator Ward Kimball, the zaniest of Walt Disney’s “Nine Old Men,” the Cheshire Cat was indeed weird and wacky but in an understated manner contrasting with the more outlandishly “mad” Wonderland characters. “The only real “mad” thing in the whole picture, in my opinion, turned out to be the Cheshire Cat,” Ward later observed. “Why? Because compared to the constant, all-out wild gyrations of the other characters, he played it real cool. His quiet, underplayed subtleties consequently stole the show!” Though Alice turns to the madcap kitty for guidance, the Cat’s toothy, ever-present smile makes him more unsettling than helpful. And of course the unpredictable Cheshire Cat’s propensity for appearing and disappearing (often leaving behind only that crescent-shaped smile) makes him one of the most uniquely funny characters in all of Disney animation. This edition is a Hand-painted Limited Edition Cel created by Disney artists. Ten paint colors were used to faithfully convey the richness of the scene. The hand-inked, hand-painted cels were created from a drawing inspired by the original animation drawings of this animated cartoon. Each cel is paired with a fine-art giclée background inspired by the original animation painting used in production of the film.